To Crack Down On Rhino Poaching, Authorities Turn To Drones Sky-high prices for elephant ivory and rhino horn have pushed wildlife poaching to a fever pitch. So in attempt to outfox the sophisticated poaching operations, conservationists and government rangers are teaming up to launch small, camera-carrying drones, or unmanned aerial vehicles, above southwest Africa. 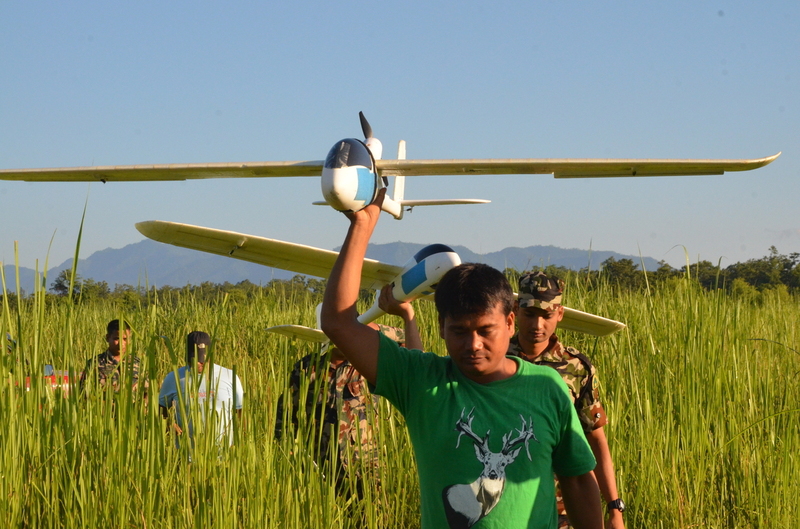 Park rangers and army personnel in Nepal carry unmanned aerial vehicles used to track wildlife and poaching activity. The drones, which can be programmed to fly automatically, are outfitted with cameras that relay live video to the ground. A crowd of wildlife rangers gathered on a woody hillside in Nepal last year to try something they'd never done before. A man held what looked like an overgrown toy airplane in his right hand, arm cocked as if to throw it into the sky. As his fellow rangers cheered, he did just that. A propeller took over, sending it skyward. The craft was an unmanned aerial vehicle, also known as a drone, though not the military kind. Its wingspan was about 7 feet, and it carried only a video camera that filmed the forest below. The flight was a test run sponsored and videotaped by the World Wildlife Fund. "It's a cat-and-mouse game when it comes to getting ahead of poachers," explains Matt Lewis, a WWF wildlife biologist who helped set up the test. Lewis says poachers are getting more sophisticated. "When poachers are starting to use night vision technology, and when poachers are starting to use tranquilizer drugs to silently dart an animal and cut off its horns at night and get out at night ... it's incumbent upon us to find a better solution to address that." Black-market prices for elephant ivory and rhinoceros horn have reached record highs, and that's pushed wildlife poaching to a fever pitch. In turn, conservationists and governments that profit from wildlife tourism are reaching for a high-tech tool to stop the killing: the drone. Lewis says drones could tip the odds back in favor of the rangers. So the World Wildlife Fund is testing simple, inexpensive versions of these aerial vehicles in Nepal and Namibia using a $5 million grant from Google. As the war in Afghanistan winds down, Lewis says, drone manufacturers are "coming out of the woodwork," looking for new customers for downsized and cheaper versions of their unmanned military aircraft. Governments are sensitive about the connotations. "Drone has a very negative context around the world," Lewis says, "primarily due to the military use." 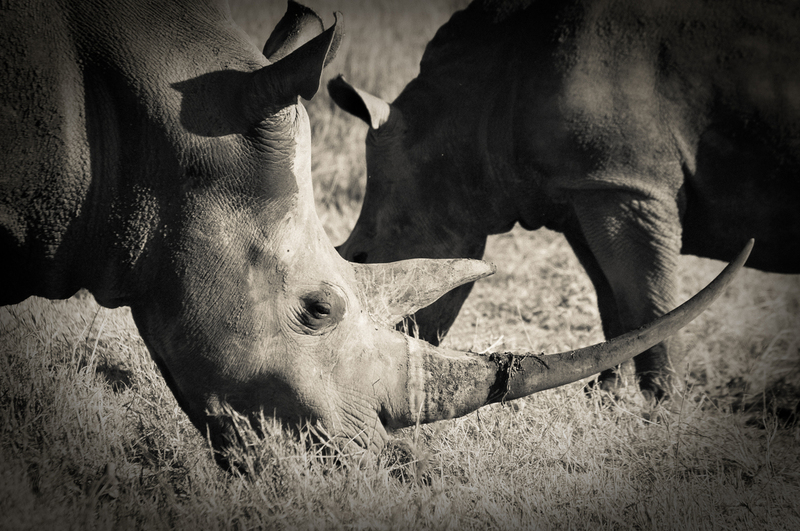 South Africa is the bank when it comes to rhinoceros horn. Most of the world's rhinos are there. "Rhino poaching right now is the worst it's ever been," says Kirsty Brebner, a rhinoceros specialist with the Endangered Wildlife Trust in Johannesburg. More than 600 rhinos were killed illegally last year, out of a total population of 20,000 in South Africa. "Our rhinos are being absolutely slaughtered," Brebner says. This young female rhinoceros, photographed in Kenya in 2011, was killed by ivory poachers a few months after this photo was taken. Last month a sophisticated drone got a weeklong trial in South Africa, and Brebner thinks it holds promise. But to be effective, such an aircraft has to be more than just a flying camera, she says. "It's not just launching it into the African night and hoping that you are going to find something," Brebner says. "It's actually doing it with mathematics and some sound science behind it." Math and science is what a team from the University of Maryland has brought to the drones vs. poachers war in South Africa. The team is led, not by a wildlife biologist, but by Tom Snitch, an economist who prefers starched white shirts and business suits to khakis and boots. Snitch's partners at the university use mathematical models to predict behavior. In Afghanistan and Iraq, they created a program to help the Pentagon predict where bombers would place improvised explosive devices — IEDs. In Africa the goal was different, but both missions, Snitch says, are about predicting the behavior of people — "in that case, IED bombers, and in [this] case, poachers." Last month, Snitch's team took four drones, made in the U.S. by a company called Falcon, to a South African wildlife reserve. The drones carry multiple video cameras, some infrared. They fly themselves, and an operator can see what the drone sees in real time on a laptop. 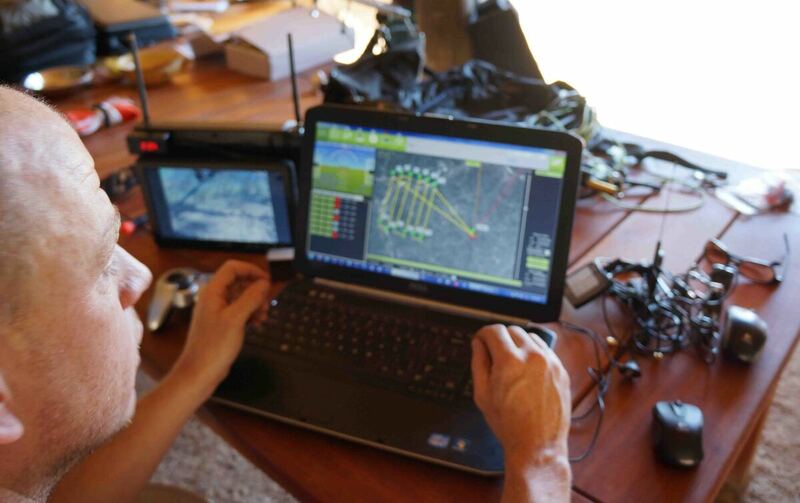 Chris Miser, owner of Falcon UAV, uses a laptop to control and monitor an unmanned aerial vehicle in test flights in May at Olifant West, a private game preserve in South Africa. But Africa is big and drones are dumb. That's where the math comes in. 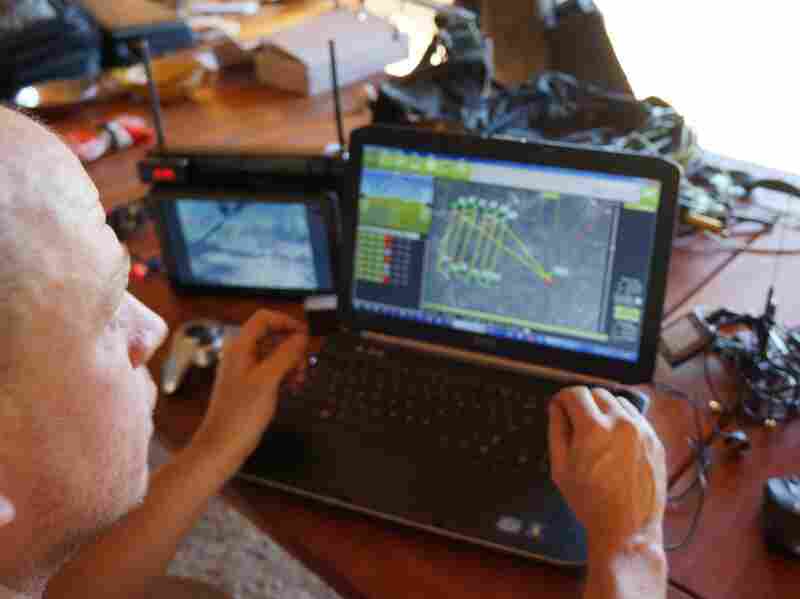 The team uses historical records of wildlife movements and poaching to write a computer program that "educates" the drones. "You can look at [these records] and ask, 'Where should we position our drones to fly at night to intercept these people before they get to the animals?' " Snitch says. "And more importantly, 'Where can you put the rangers between the rhinos and the poachers?' "
For example, the designers plug in the location of water, or trails the rhinos commonly use. They program poachers' behavior into drone's software and flight plan: Poachers usually strike near the time of a full moon, and about 8 p.m., which gives them a whole night to make their getaway. Snitch's team ran several trials in South Africa, and a Falcon drone successfully tracked all sorts of animals — wild dogs, elephants and, most importantly, rhinos. On one run, they found something more than just animals. "We put the drone up," Snitch says, "and sure enough, right underneath us was a [rhino] mother and a calf. They were about 75 meters from a fence line. And we saw a car pull up to the fence line and stop." They reported the car to local rangers, though it turned out the folks in the car weren't poachers — this time. These experimental trials went well, Brebner and Snitch say, but the ultimate test will be political: If drones catch poachers, will governments prosecute them? With so much money in the ivory and rhino horn trade now, the two researchers say, it's going to take a lot of political will to stop it. 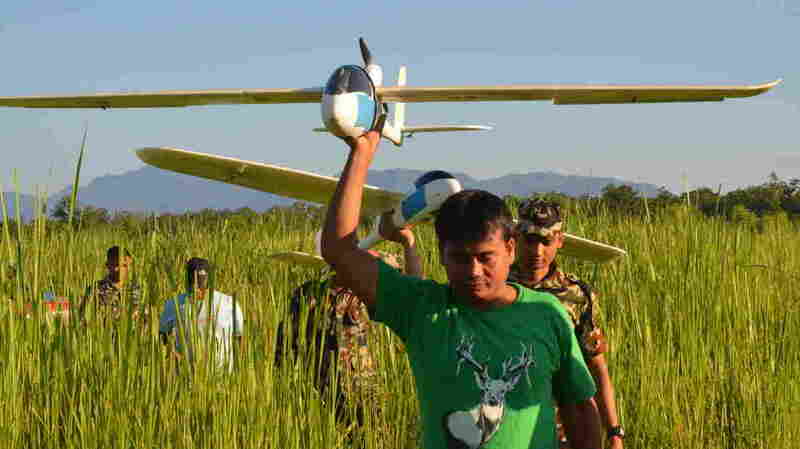 The drones used to track wildlife and poachers are small enough to be launched by hand.